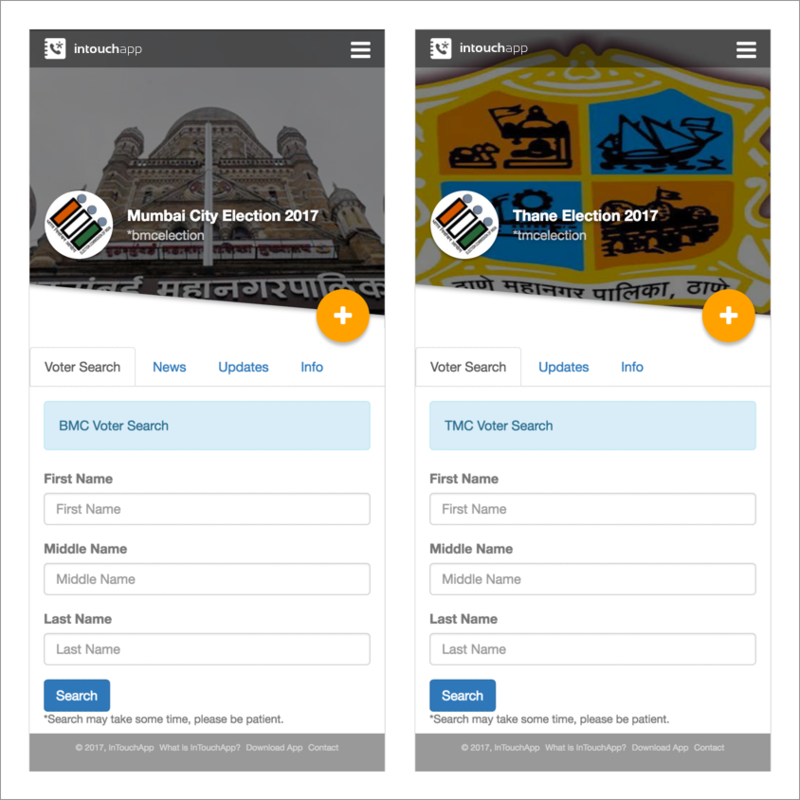 Helping people get out and vote: How InTouchApp brought information to voter's fingertips. Every year, many eligible voters miss out on getting inked simply because searching your name in the voter list, and getting your booth information is a tedious task. The seemingly straight-forward process of getting your voter information becomes a struggle, when most people give up trying to locate the search page in the first place. When you make voters jump through hoops to get the most basic information required to cast their vote, there’s no surprise that voter turnout is consistently low during elections, across the globe. In their book Controversies in Voting Behaviour, Niemi and Weisberg write that voter turnout has been at a steady decline since the last 40 years, especially in United States, Latin America, Japan, Canada and Western Europe. Taking a recent example, in the 2016 U.S. Presidential Election, the voter turnout was only 57.9 percent, which is lower than 2012(58.6 percent), and 2008(61.6 percent). To combat this problem, the Government usually provides necessary information to the voter through their website or mobile app. Quite often, the website is difficult to access on mobile, and downloading an app for one-time use only seems pointless. At InTouchApp, we have been toying with the concept of micro-apps for a while – that bring the best parts of native apps and traditional websites, without requiring the user to download another app on their phone. A micro-app works inside any browser installed on the user’s phone or InTouchApp, which makes it easily accessible on a desktop as well. 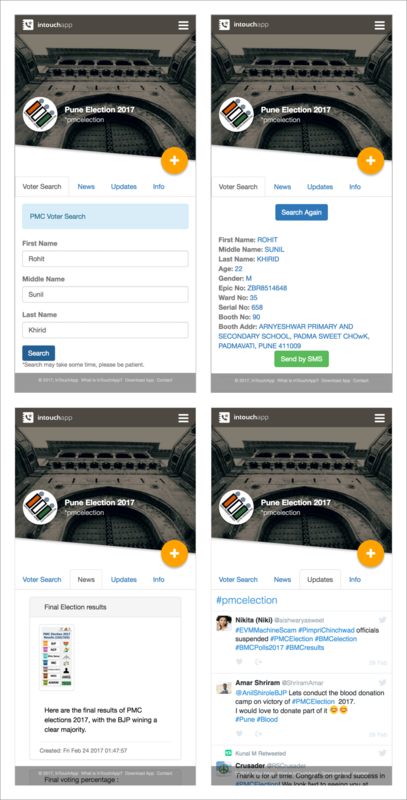 To start off our little experiment, we created an election micro-app for Pune based voters, which made it incredibly simple for them to search their, or their family and friends’ name in the voter list. All they had to do was type in the name, and we’d fetch their voter details. We also introduced an option, for the voters to send their voter information to their phone via an SMS, and getting a reminder SMS on the day of the election to go out and get inked. The micro-app came with an integrated twitter feed as well, that allowed people to stay up to date with the news surrounding the election. After the Pune micro-app started picking up, we began getting requests from users to create the same for other cities including Mumbai, Mumbai Suburb, Pimpri-Chinchwad, Nashik, Amravati, Solapur, Nagpur, and Thane, which we worked on for the next few days. The whole idea behind a micro-app was given a green-light by political candidates including Mr. Sunil Tingre, Mrs. Sangeeta Thosar, Mr. Rupesh Ture, Mrs. Ujwala Nalavade and Mr. Deepak Bhondve. We provided them with micro-app of their own, to interact and stay in touch with the voters of their constituency during and after election campaigning. 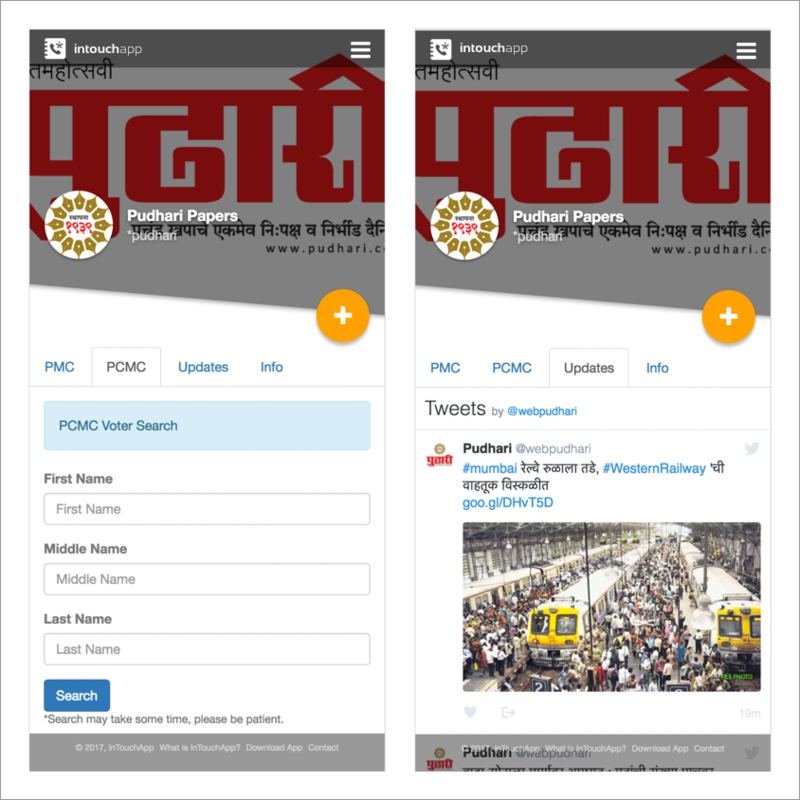 As a next step, we partnered with Pudhari Papers – one of the leading Marathi daily newspapers, for their #PledgeToVote campaign, where readers could make use of the Voter Search enabled in the Pudhari micro-app. Additionally, we also set up a missed call service for Pudhari’s readers, powered by Exotel. By simply giving a missed call to this number, you were sent an SMS with resources to search your name in voter list, and get a reminder to go vote on election day. 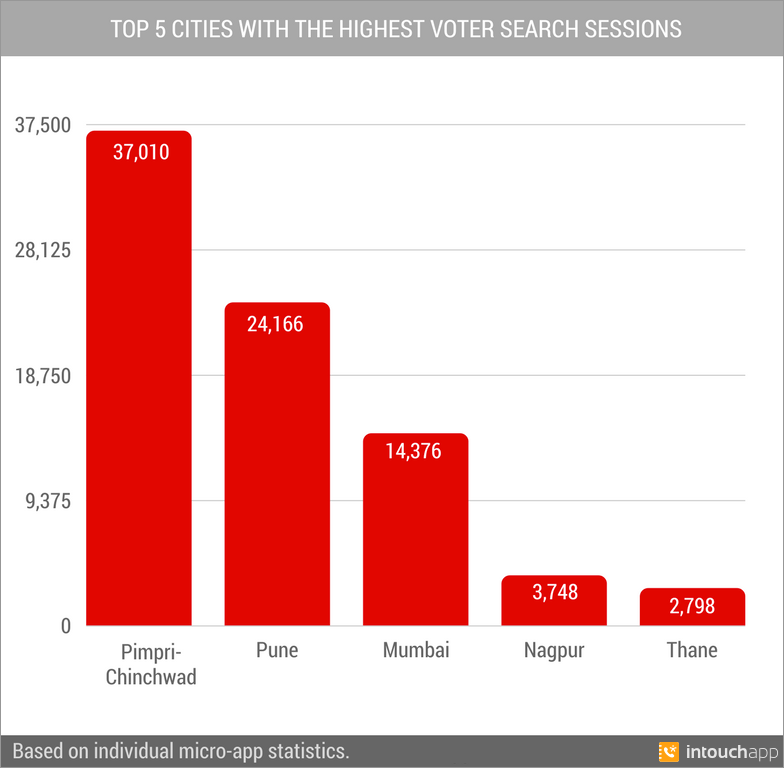 We recorded an impressive 11,917 missed calls over the next 6 days, and 23,513 voter search sessions from Pudhari’s micro-app alone. 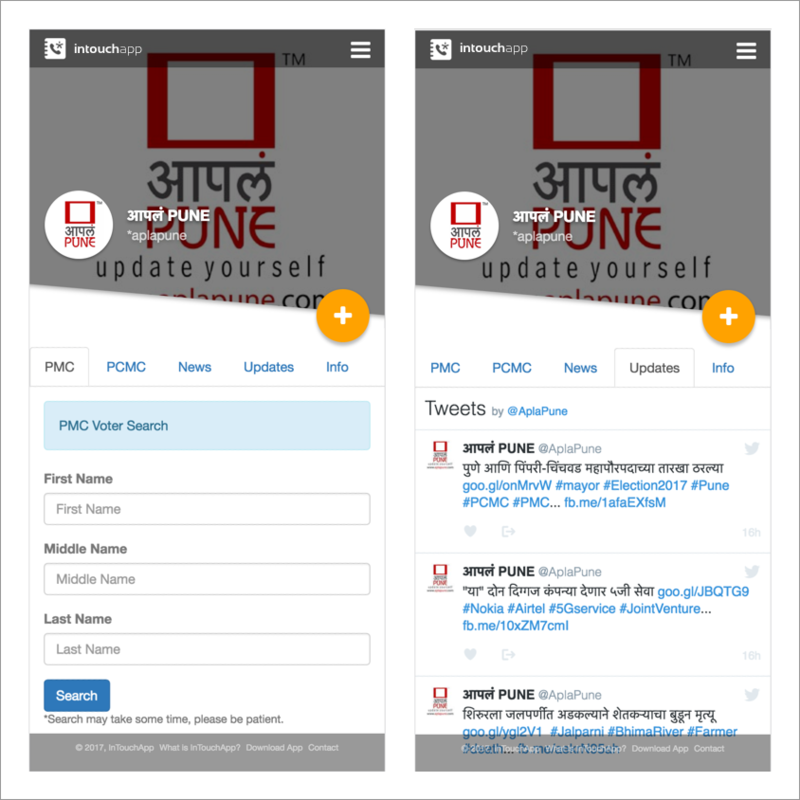 A similar association with Apla Pune – an online news portal, observed 5269 Voter Search sessions on the Apla Pune micro-app. In the end, the substantial increase in voter turnout proved that using technology to make information easily accessible can work wonders. Here are a few highlights of the recent election, and the numbers speak for themselves. 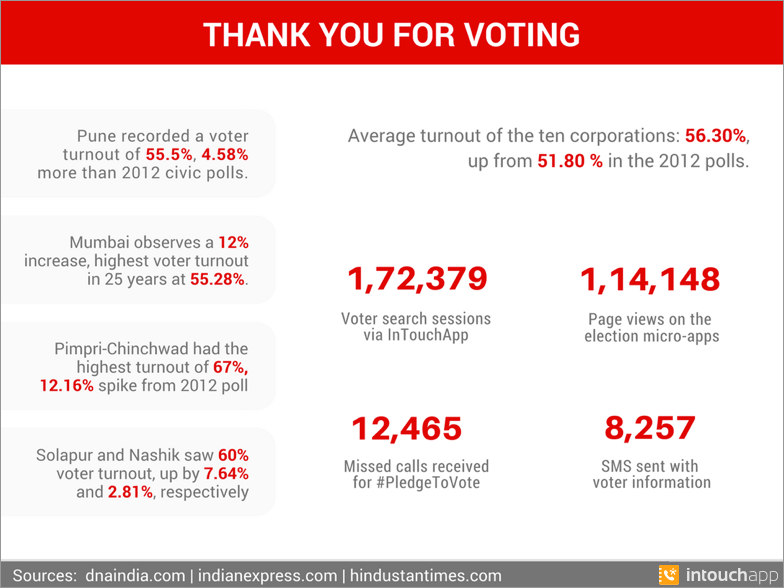 With the curtains down on the Maharashtra Municipal Election 2017, we are happy to have played our part in making sure that people come out in large numbers to exercise their right to vote, and participate in how their city progresses in the next 5 years. We look forward to experimenting with the potential of micro-apps in the near future, and how they can rid us of minor and major inconveniences in every day life. If you have suggestions for us regarding what our next big micro-app should be, tell us in the comments, or drop us a line at support@intouchapp.com.